Discussion in 'News and Features' started by Tom Goh, Jan 29, 2019. BMW Malaysia unveiled their new charge facility just moments ago, specifically 6 BMW i Charging bays at the basement parking in Bangsar Shopping Centre. Today's launch continued with BMW Malaysia's new chapter in Visionary Mobility in the country supported by their record growth in vehicle deliveries and product portfolio for the new year. 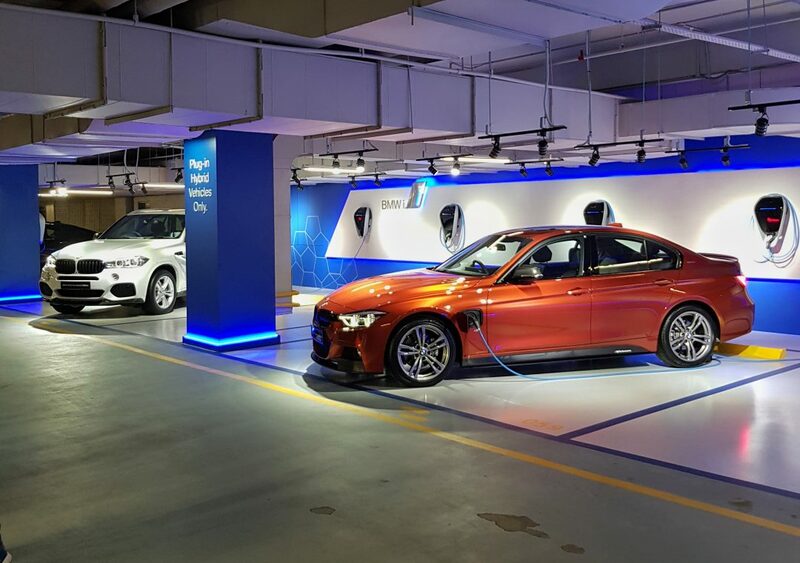 BMW Malaysia unveiled six New BMW i Charging Facilities at Bangsar Shopping Centre, marking another important step in its industry-leading efforts in fostering the country’s shift to Electro-Mobility. This follows the introduction of new BMW i Charging Facilities at Ramada Plaza by Wyndham Melaka, The Banjaran Hotsprings Retreat in Ipoh, the Iconic Hotel in Penang as well as at WEIL Hotel in Ipoh last year. BSC is usually packed. It's more than likely dumbass idiots will park their Myvis and Vios' there and why make an already packed parking lot even smaller by dedicating special lots? same story at my workplace. They award parking lot for so many managers & section head until only abt 16% of the parking is left for other staff. Its like a thing to makes u 'feel good' when u have it.well,it manages to attract some peoole to join the company. Fortunately, the guards @ BSC does a good job. This used to be Mercedes bays, 3 of it. Always packed with PHEVs. At my previous workplace they located 2 charging bay for EV or hybrid. Before i left the company, only 1 bay is used by a BMW 330e. Its a plus as the lot is located at the GF parking (shaded) and esay to drive out plus no need to worry abt parking being full. Then they moved the lot to an open area...nobody uses it since. I think it was 1utama where I saw a green Myvi parked in the "green cars only" parking lot or something. Then there's the tonnes of complaints from EV cars about other EV parked cars hogging EV bays and all that good stuff. Anyway, why is EV such a big deal when the Gov themselves are not seemingly encouraging EV cars? It motivates PHEV owners to go there instead of the mall next door. BUT, we need more of these bays. Menara Maybank actually have 2 bays and the people there kinda organize themselves well, they will shift their cars once they are fully charged. I assume they must have a chat group or something. Most Menara people got nothing to do. Removing car from charging lot is a strong excuse to leaves a dull meeting or go yamcha.